Alice used to find it quite hard to cook steak, but this method (inspired by Nigella Lawson) keeps it deliciously tender. 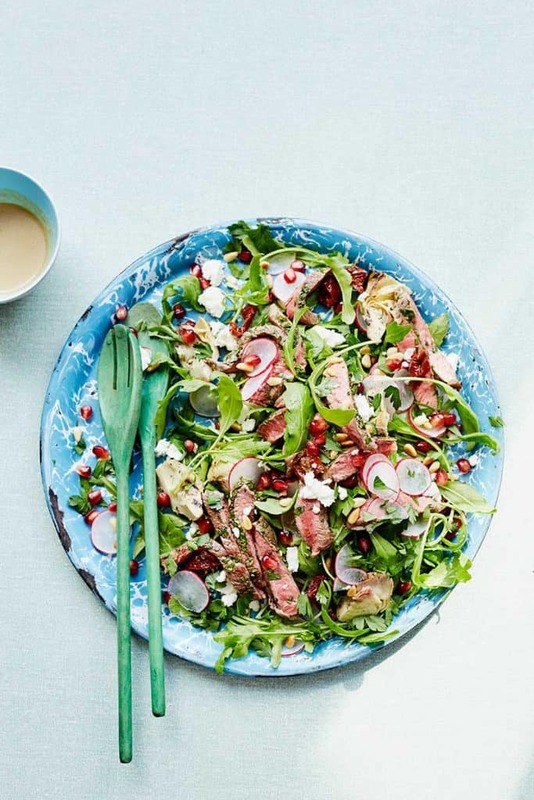 The marriage between the iron-rich steaks, the colourful salad, the zingy horseradish, and the creamy feta cheese are perfect. I use artichokes and sundried tomatoes from my local supermarket’s deli counter, which saves a lot of time. Be sure not to buy artichokes soaked in vinegar, though, as the flavour will overpower the salad. If possible, use grass-fed steak, which contains more nutrients than intensively farmed beef. 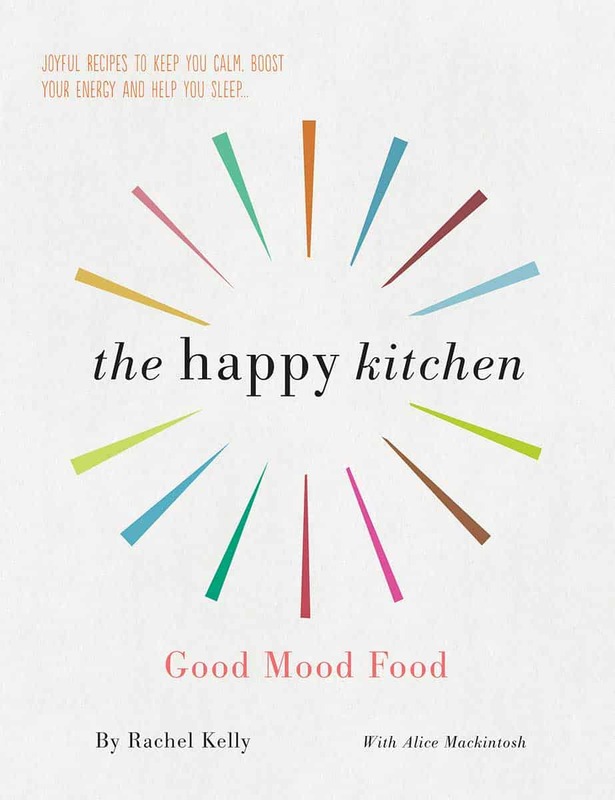 Extracted from The Happy Kitchen by Rachel Kelly and Alice Mackintosh. Published by Short Books, £14.99. First make the dressing by combining all the ingredients and shaking them together in a jar. Trim the harder fat off the steaks, brush with oil and season both sides with salt. Heat a griddle or heavy-based pan, and add the meat once hot. Cook for 4 minutes on each side. If you prefer your steak well done, then leave for another 1−2 minutes on each side. Meanwhile, make the marinade. Whisk together all the ingredients in a dish big enough to accommodate the cooked steaks. Place the steaks in the marinade for 8 minutes, turning them halfway through. Then remove them to a board and slice them thinly on the diagonal. While the meat rests, combine the salad ingredients in a large bowl. Pour over three-quarters of the dressing and toss everything together. 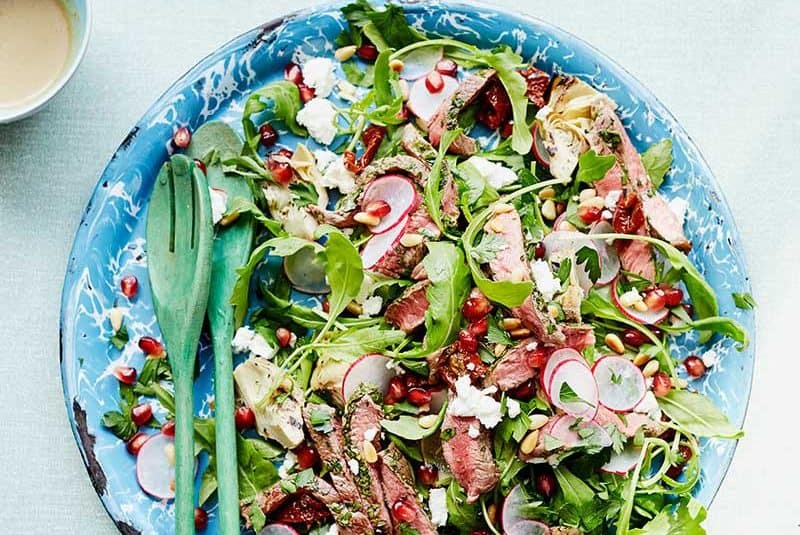 To serve, place the sliced steak on a bed of the salad and pour over the rest of the dressing. Scatter with toasted pine nuts, if so desired.